Prairie Green at Fay's Point was okay, I like it very much. They have Wii games and exercises. They have physical therapy if you need it. They have a library and a computer room. The best way to get to know a community is by scheduling a tour. 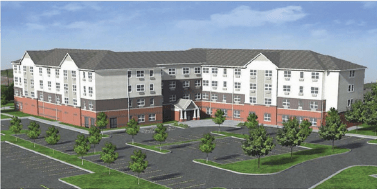 See the facilities, meet the staff and residents, and get a feel first hand what it's like to live at Prairie Green at Fay’s Point Assisted Living. Retirement means you should spend time pursuing hobbies and exploring new sites, not worrying about household repairs or having to clean the house. This is why Prairie Green at Fay's Point is designed for active seniors who are ready to shed responsibilities in exchange for a carefree life. You still have all the privacy of living in your own home while enjoying the added benefits of an art center, billiards room and a library just down the hall. Prairie Green at Fay's Point is one of many retirement apartments owned by the Senior Lifestyle Corporation. We pride ourselves on creating senior living communities that enable seniors to live healthy and fulfilling lives, and our Wellness Everyday program offered at every community is praised by the International Council on Active Aging. Life is on your terms at Prairie Green at Fay's Point, which means if you want to spend the day with a good book in the courtyard or go birding in the wetlands bordering our community, the choice is yours. There is also a fitness center where you can spend the morning exercising before joining friends for a game in the billiards room. And when family visits, your grandkids will love to play in the grandkids game room. Breakfast, lunch and dinner - meals are always on us so you won't have to wash dishes again. Every day the community dining room is filled with the mouth-watering smells of meals prepared fresh with locally sourced ingredients. Our chefs encourage residents to share their favorite recipes so they may be incorporated into the menu for everyone to enjoy, too. When joining our community, you can choose from a spacious studio or one-bedroom apartment floor plan. Standard features include a kitchenette, closets and an emergency call system. With our staff handling the weekly housekeeping, your apartment will always be ready for friends to drop by for a visit. Personal laundry service is also available, and there are laundry facilities available on each floor. Care that's always there is what we promise to deliver each and every day. Whether you only want an escape from household chores or need a bit of help with life's daily activities, we will create a customized care plan that is tailored to meet your needs and promote your well-being. Both our professional service and clinical staff are available 24 hours a day to provide help whenever it is needed. After a life of work, you are entitled to five-star living, so come join Prairie Green at Fay's Point and indulge yourself.